The head of an elderly Kazakh woman, an apashka, wrapped in a traditional headscarf slowly glides into a CT scanner in a hospital. Where would it be possible to see such a surprising frame? Perhaps only at a festival where, for the opening ceremony, a modern pop group steps on stage in sheepskins to sing about the friendship between a little wolf and a boy: the Eurasia Film Festival in Almaty, the cultural capital of Kazakhstan. The festival took place between 23 and 29 September 2007—for the fourth time and for the third year in a row. Despite organizational problems, especially the unsatisfactory quality of film screenings in the House of Cinema, it is finally possible to state that Eurasia has become a vital festival, one of the most anticipated film events in Central Asia. This year, after the usually noisy and colorful opening in the Palace of the Republic, an emotionally saturated festival began to the special delight of fans of Central Asian cinema. Indeed, a whole series of long-awaited new films by established directors—like Darejan Omirbaev, Ernest Abdyzhaparov, and Rustem Abdrashev—were screened at the festival, together with debut films by young, talented directors of earlier shorts, such as Abai Kulbai and Serikbol Utenbergenov. Most pleasant and surprising was the fact that virtually none of the much-expected films brought a major disappointment. Perhaps the only big disappointment was Umarasa by Serikbol Utenbergenov (Kazakhstan, 2007). It was a somewhat pale copy—or maybe parody—of genre cinema, where it was difficult to recognize the hand of the young director who, in his previous short film Numb Coolness (Nemaia prokhlada, 2004) had shown a fine understanding of framing, lighting, and sound, as well as finding two wonderfully agile and convincing actors (Vitalii Kupriianov, Nurzhuman Ikhtymbaev). Umarasa, his first full-length feature, however, cannot boast of either its script or expressive framing, or even of a single charismatic actor. Film scholars joyfully remark that films selected in the same year for a festival often share general themes, common aesthetic or moral problems. While this is also somewhat true of the Eurasia festival, the situation is not entirely the same. As Birgit Beumers rightly highlighted at a roundtable of film critics and scholars held on the penultimate day of the festival, it is difficult to speak about “selection” in the Central-Asian and Turkic-language competition because of the extremely limited number of films made in the region; instead, this competition represents a panorama of films produced in any given year. Consequently, it is even more curious to find thematic concurrences between films: they testify not so much to the taste or interests of the Selection Committee as they demonstrate certain subjects that have disturbed directors in different areas of the region and have given them cause for reflection. And so, the first similarity amongst several of the competition films is a metaphoric approach to reality, together with an aspiration to capture the situation of the country in one single comprehensive image. It is interesting to note that two Uzbek films chose for their settings a hospital (Muruvat; dir. Bako Sadykov, 2007) and a psychiatric clinic (My Soul is Captured by Grief; dir. Sabir Nazarmukhamedov, 2007). In Metamorphosis (2006), Kyrgyz director Gennadii Bazarov offered a slightly different metaphor, but one that was also designed to evaluate and represent modern society: the film's protagonists enjoy themselves and have a good time while watching a “game” of suicide, in which each move leads to the death of one of two players. In all three films, the theme of deceit is also important: at the end of Sadykov's film, the heroine disappears altogether, only her empty wheelchair rolls across the streets of the city. As for the heroine of Metamorphosis, she discovers that in the conditional world in which she finds herself, even death is merely a staged affair. Probably in connection with this openly metaphorical approach, all three films are rather weakly and pompously directed, over-emphasizing dialogues and creating two-dimensional characters. Another issue that many Central Asian films address is the question of the relationship between tradition and innovation or modern life. This theme is embodied in a variety of ways; practically all of the films shown at the festival seemed to fall into two opposing categories: those that addressed tradition and the village, and those that represented urban cinema. In this context, I shall not consider what might be classified as the “decorative” approach to this problem, films like Bolat Sharip's Sin (Grekh; also as Holy Sin; Kazakhstan, 2006), which is made in a manner that essentially ignores cinematic developments of the last fifty years. Both Kazakh films presented in the international competition reflected this opposition: the action of Darejan Omirbaev's Shuga (2007)—a lose adaptation of Anna Karenina—is set in the city, among rich people surrounded by modern technology, while the little hero of Rustem Abdrashev's Patchwork Quilt (Kurak Korpe, 2007 ) is hurriedly taken from the city to the village where he will live up to the end of film. The choice of city or village as the setting for filmic action also entails a choice of language: in modern Kazakhstan the urban population mainly speaks Russian—thus emphasizing the directors' preferences even more so. 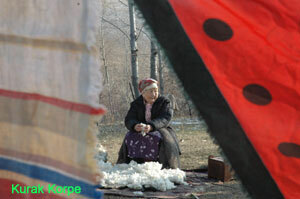 While Patchwork Quilt is shot almost entirely in Kazakh, in Omirbaev's Shuga and in Abai Kulbai's Strizh (2007) the heroes communicate basically in Russian. It is noteworthy that the youthful Kulbai repeatedly spoke about his unwillingness to make an “exotic” film and emphasized his aspiration to speak in his film about what he knows best: the city. Even when writing the script, Kulbai declared that his film had two main heroes: the teenage girl Ainur and the city where she lives—Almaty. The opposition between tradition and modernity can be seen not only in the collision of different directors' preferences, but also within a single film. The opening shot of Patchwork Quilt is quite telling in this sense: in the first frames we see a young girl with a helmet riding a motorbike directly towards us. She is surrounded by an industrial cityscape that is reflected in her shiny helmet. Then follows a wide static frame: before us are mountains and, tracking slowly from right to left, the camera captures a horseman with a golden eagle on his sleeve. Tracking shots versus static camera positions, forward movement versus side tracking: the theme and style are fully established. From these two shot sequences, we seem to have been watching two different films. A little later in Patchwork Quilt we shall also see that very same grandmother- apashka of the main hero, who has come in her traditional dress to a consultation in the city hospital. Ernest Abdyzhaparov's Cool Pureness (Boz salkyn, Russian title Svetlaia prokhlada; Kyrgyzstan, 2007 ) also very precisely explores this key problem of modern Central Asian cinema: the film's heroine, who has grown up in the city, becomes the accidental victim of traditional “bride theft” and is forced to live in the mountains with a man—now her husband—whom she does not know. There is no doubt about what Abdyzhaparov prefers, tradition or the present. It is enough to recall one of the most surprising scenes in the film, when the heroine, alone in mountains, performs for herself (and for the fascinated spectator) a modern dance in her traditional costume against the background of mountains and yurts. For the first time since the beginning of film, she looks genuinely happy. 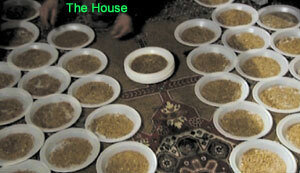 The same theme can also be seen in the talented mid-length film by Azeri director Azif Rustamov, The House (2007) . The film's hero refuses to sell his small, old house that should make way for the construction of a modern building. Throughout the film we see his modest efforts to earn a livelihood. His trade is the growing of seedlings, which provides the director with an ideal opportunity for some surrealistic imagery (a house full of plates of growing seeds, shot many times over from above, making them look quite strange). Better than any words, this image conveys the gradual absorption of traditional living space as an irreversible process, whether through the growth of the seeds or through encroaching modern life. The idea of nostalgia is rendered in the film very finely and expressively with the help of a slow camera that is attentive to unimportant moments of life, which make up the hero's departing happiness: breakfast with his beloved, long walks, tenderness in the midst of an ever-changing space. Once again, it is impossible to dismiss as a mere coincidence that two films in the Central-Asian competition have almost the same title: the Azeri director entitled his film The House, while the Uzbek director Aiub Shahkobiddinov has called his film The Yurt (2007). The Yurt, shot on the basis of a script by Yolkin Tuichev and shown at the Kinoshok festival, where the actor playing the father (Nazim Tuliakhodzhaev) received an award for his talented performance, differs , perhaps , from The House in that it combines within it both of the themes of the Eurasia festival. On the one hand, this yurt, far away from civilization, whence the loving but strict and harsh father does not want to let his son depart, obviously offers a certain metaphoric image of the countryside and its relationship with the young generation (we need only recall how, trying to keep the son at home, the father shouts: “There is nothing out there, son, they've lied to you!”). The film obviously stresses both the antagonism between town and village, as well as between tradition and the present: the television that the son sets up in his yurt, and which can be seen as a symbol of progress, is perceived as an imminent danger—and even disease—by the father, who buries it. He has to do the same thing later with his son, fatally infected by modernity: he has become a drug addict. There is another reason to end this review on a positive and encouraging note: despite the rich film crop of 2007, the festival participants did not get the impression that the next set of interesting films are to be expected only in a few years. 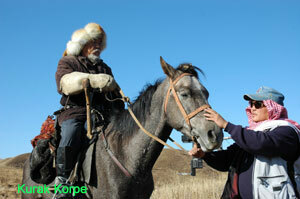 At the project market we saw that the classic director Ardak Amirkulov has almost completed work on Farewell, Gulsary. Amirkulov is a director to whom Kazakh cinema is obliged not only for his well-known films, but also for a new generation of talented directors who have graduated from his workshop. Sabit Kurmanbekov is editing his first full-length film (Aulym Enim ), after working as set designer and actor in Serik Aprymov's The Last Stop (Konechnaia ostanovka, 1989), as production designer for Nariman Tulebaev's Little People (Malen'kie liudi, 2003), and after his excellent short The Road (Trassa, 2005). The young director Erlan Nurmukhambetov is preparing his debut film Kelin, based on a script by Aktan Arym-Kubat (formerly known as Abdykalykov). And the program “New Young Kazakh Cinema,” curated for the festival by Inna Smailova, gave the impression that new discoveries and filmmakers are in store.